ONESuit® Pro, Rochdale-based Saint-Gobain Performance Plastics' totally encapsulating gas-tight suit, has now gained SOLAS Type II-2 certification per the requirements of International Maritime Organisation (IMO). This certification confirms that the suits offer the highest level of protection against liquid and airborne chemicals for personnel working within the shipping and naval sector. Maritime personnel, such as emergency teams, coastguards, port authorities and maintenance organisations, working with hazardous chemical or biological materials can now benefit from a hazmat suit engineered for robustness, comfort and durability, and maximum protection against more than 100 chemicals both on land and at sea. 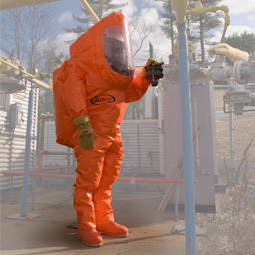 The Saint-Gobain Performance Plastics ONESuit® Pro is described to be lightweight and versatile, designed to safeguard against the permeation of chemical and biological substances in both liquid and vapour form. The ONESuit® Pro is already EN 943-2 certified as well as being approved per NFPA 1991 and thus meets the standards required for the highest level of chemical and biological protection within the EU, USA and Asia. ONESuit® Pro is engineered using the Coretech® barrier membrane technology. The material has been tested against harsh physical and climatic conditions to ensure that it maintains its high resilience, durability and flexibility performance levels and suffers no significant degradation. Additionally, the flexibility of the ONESuit® Pro suit material allows for easy storage in vessels or maritime transport vehicles that are space-constrained.